A journey that began several years ago has recently reached its end. 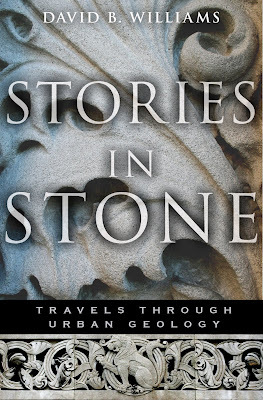 That journey has led to the publication of my new book – Stories in Stone: Travels Through Urban Geology. A copy of it arrived in the mail the other day and it should be in book stores soon. The publisher is Walker & Company. My interest in building stone began in 1986, when I first wrote about the sandstone used at my college. I realized I could make a connection between two passions of mine, geology and architecture. Furthermore, building stone was a way to tie together people and rock into compelling stories, what I later decided was John McPhee in reverse. Instead of going to the wilds to find geology, as McPhee did, I would go downtown to find the rocks and develop my stories from there. Over the next ten years or so, I continued to seek out building stone stories, particularly in Seattle, where a series of rock-rich tunnels were built for public transportation. The stone was not only diverse it was beautiful. During the decade, I didn’t limit my geologic gazing to urban spaces. Living in Moab, Utah, I happened to notice that some rather stunning stone outcropped in the region. The red rock landscape made me even more fascinated with and passionate about geology so when my wife and I moved to Boston, I went into rock withdrawal. I quickly turned back to my long interest in building stone and began to study the rocks that clad buildings in the Hub. I found sandstones, granites, slates, marbles, and travertine, and all of them had great geologic, as well as human, stories to tell. In 1997, I sold my first article on building stone, to the Harvard alumni magazine. Over the next few years, I wrote additional articles for in-flight magazines, newspapers, and kids magazines. Finally in 2005, I decided I either had to write a book or give up my interest in building stone. I began by sending an eight-paragraph pitch to an agent a friend had recommend. She responded a day later and by the end of the week she had agreed to represent me. And then the work began. Ten, very long and often challenging months later my agent began to shop around the 57-page proposal she had helped me to write. About a week later we got our first response. Walker & Company liked the proposal. Within a few days several more publishers had expressed an interest. On September 28, 2006, we accepted Walker’s offer and I began work on the book. Writing Stories in Stone has been a wonderful journey for me. Along the way, I have met architects, historians, librarians, geologists, quarry workers, and stone masons. I have been fortunate to work with a supportive, helpful, and encouraging editor. People have gone out of their way to help me track down papers, to take me out in the field, and to show me the inner workings of the quarry business. Over the next few weeks, I plan to write a series of posts about the book. I hope to include photos and maps, background on the chapters, and links to more information. Congratulations on the book! I love the cover, beautiful. This is now on my ‘books to get’ list. How exciting. Congratulations. I’ve already pre-ordered it from Amazon (a June 23rd release date). The editorial reviews posted on Amazon are great. Looking forward to getting it and reading the book.